During the 1996 G3/Fire Garden tour, a Chorus Ensemble was used on an on-stage pedalboard. On his pedalboard, Miles has a blue Boss Chorus pedal. A pair of Boss pedals—an OC-3 Super Octave and CE-5 Chorus Ensemble—complete his onstage stomp box selection." Normally I use chorus for ‘Pretty Woman,’ but we’re not playing that song this time,” says Van Halen. “On this tour I use it for ‘Drop Dead Legs,’ and I also use the octave pedal for the outro riff on that song." From a interview from Eddie discussing his live rig for the 2015 tour. The CE-5 Chorus Ensmble can be seen in Jerry Cantrell’s pedalboard at (5:32) in this premier guitar Rig Rundown. Zakk Wylde talks about his CE-5 Chorus at 2:42 by saying, "And then I got the Boss Chorus pedal over here right now...It just fattens things up a little, you know?" Brad Delson, Linkin Park guitarist, uses the Boss CE-5 Chorus Ensemble Pedal on his pedalboard at 2:25. Malmsteen uses a Boss CE-5 chorus pedal, as seen in this Premier Guitar interview at (5:40). "If I play clean, I usually have [the chorus] on," he said. In this video Marty Friedman talks about the equipment he uses, including the BOSS CE-5 chorus pedal. The pedalboard is clearly visible first at 1:30. According to his [website](http://www.davekushner.com/gear.php), Dave Kushner uses a Boss CE-5 Chorus Ensemble pedal. According to Reverb's website, his current list of pedals also includes the Boss CE-5 Chorus Ensemble. In this Seymour Duncan interview, Ray says "I just have a Dunlop Crybaby wah, Boss EQ pedal, Boss Pitch Shifter to do harmonies, Boss Chorus Ensemble, and Electro-Harmonix POG Polyphonic Octave Generator"
"Included in my CAE unit is: Rocktron Prophecy 2 for some clean tones (it will be weeded out after I get more familiar with the Fractal), MXR Zakk Wylde Overdrive, MXR Super Fuzz, BOSS CE-5 Chorus…"
Instagram post from Jimmy Smith from November 2017. He says: > This here gizmo is gonna carry me to the rings of Saturn and beyond. Big thanks to @fender and true source of inspiration Ed O’Brien for inventing this beauty. A Boss CE-5 Chorus Ensemble can be spotted amongs his other pedals. Brian Welch's Boss CE-5 can be clearly seen at 16:25 in this video. In this Rig Rundown Shaun Morgan talks about his equipment for upcoming Seether Tour. His pedalboard can be seen 4:46 into the video, with Boss CE-5 on it. on this video at 04:17, Troy use this pedal for clean sound. At 0:59 minute mark, Boss CE-5 can be seen under the Musonic Phaser. 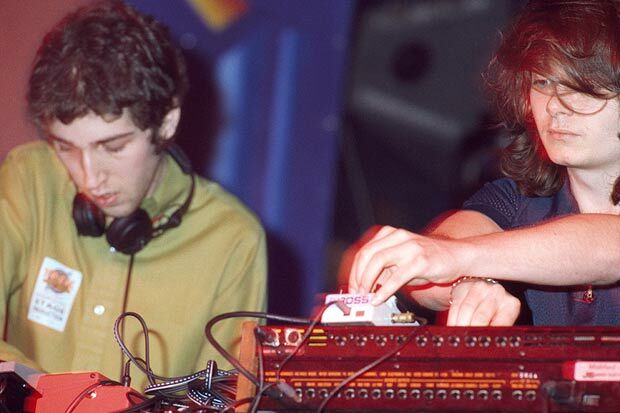 "We also used some BOSS [CE-5] choruses and [OC-2] octave dividers. I also like the fact that the BOSS pedals are colored, so we talk about them in terms of … ‘the orange one, the green one,the red one, the purple one, the blue one’ [laughs]." In this Instragram photo from Oct 2015, Jessica gives fans a shot of her current pedalboard. The Boss CE-5 Chorus Ensemble can be seen on the upper left. 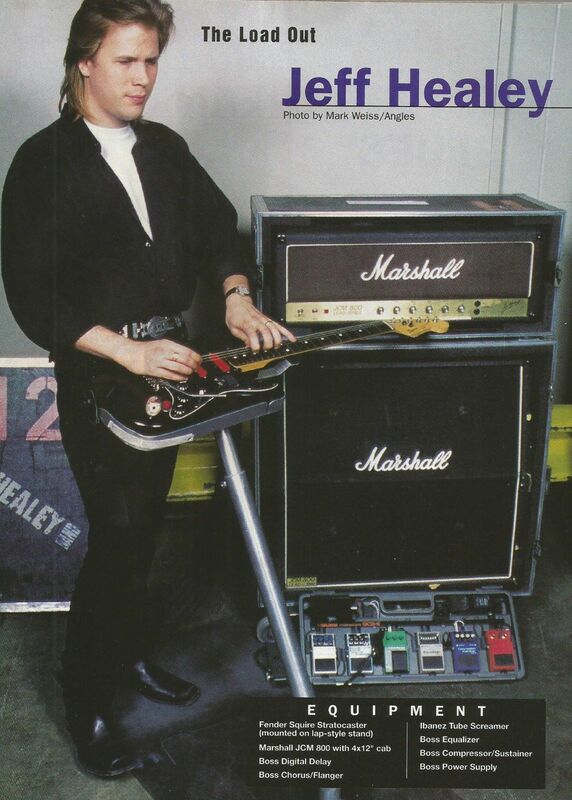 On this photo Jeff Healey's pedalboard contains a Boss CE-5 Chorus Ensemble. According to Eagles' guitarist Don Felder in this video at (3:50), he uses a Boss CE-5 chorus pedal in his effects chain. In this photo, we can see Boss CE-5 Chorus Ensemble. In this source photograph, Craig Nicholls is pictured playing guitar onstage with the Boss CE-5 Chorus Ensemble in front of him. This video from DunlopTV features the guitar tech of TOOL's longest acting bassist, Justin Chancellor. As he runs through some of the pedals within Chancellor's pedal board, we see that the over-all board is in 3 sections. The camera does a tightly zoomed pan of the board and shows the BOSS CE-5 Chorus Ensemble. Shown on this Guitar Geek Diagram, is Herman Li's Boss CE-5 Chorus Ensemble. Michael have this pedal in his pedalboard.He often used it for some coloring in his live performances. "I play through a Fender Twin, and my pedal setup is super basic: boss chorus and tremolo, boss dd-6 delay, a fulltone fulldrive coupled with an electro-harmonix lpb-1 boost for good natural tube overdrive, and that’s pretty much it." 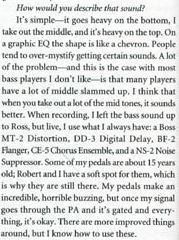 In this [interview from the October 2004 issue of *Bass Player* magazine](http://www.picturesofyou.us/04/04-10-bassplayer-simon-interview.htm), Simon says that he uses the CE-5 in his live rig. Can be seen at 15:29. This item can be seen at the very beginning and throughout the rest of the video. Regarding Hammock's new pedalboard, they've achieved a better sound while including a Chorus Ensemble by Boss. Found at the center of the photo. Bowman uses a Boss CE-5 in his rig in this live photo. This article states that Watson used this during his time in Big Country. Visible in Noodle's room in the Gorillaz app. At 5:46 the ce-5 chorus pedal is shown. 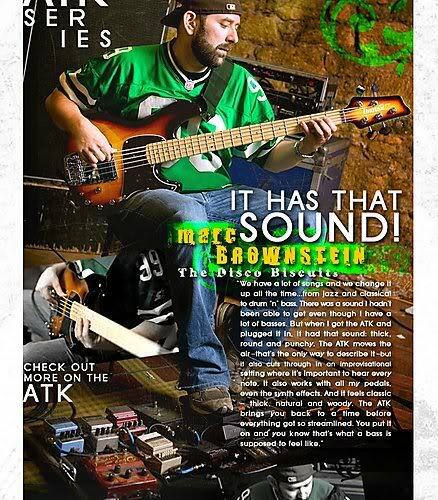 In this Ibanez advert, some pedals in Brownstein's pedalboard are visible, including the Boss CE-5 Chorus Ensemble. This can be seen to the left of the flanger. In this insta pic a Chorus Ensemble CE-5 can be seen right next to Orla's Polytuner pedal. On some pictures on his solo musical project facebook , we can see it. Could be predicted at around 0:50 mark. Do not get this pedal confused with the song War Ensemble by Slayer, they are 2 totally different things. This is an amazing chorus pedal from boss. It has a nice soft-fairy-jingly sound, really I cannot describe it. An amazing pedal overall. One of the best chorus available ! Even if i’m not crazy about chorus this pedal is a must to sometimes add depth in your sound. The best chorus i ever heard is on a roland chorus amplifier but this is a good pedal to have in your arsenal. Truth be told, I'm not a huge chorus fan, but you kind of have to have one. I don't know if this will stay, but it has been with me quite awhile. It has more control flexibility than I have ever used and it took awhile for me to find sound useful to me, but I'm there now, so it's part of the stable. With my current set-up, I have not quite found the Scofield sound, but that's probably more me than anything on my board! perfect balance for any psychedelic backing. It doesn't emphasis the indie rock sound too much which is perfect. good for interludes and verse riffs .. The second pedal I owned. I've been playing guitar for over seven years now, instruments, amplifiers, and pedals have all come and gone. This one always stayed. Just a damn good pedal. I keep almost all the knobs at 1 o'clock. I purchased mine second hand and could tell it had seen a lot of use. Well, Boss builds some amazing tank of pedals because it still works and is AWESOME! Excellent Chorus pedal! I had a choice between the Chorus Ensemble and the Super Chorus. Glad I went with the Ensemble! I use it mostly to play Brazilian 80's rock. An instant classic among artist, comes with two outputs (mono), you can split between to amps, one with the effect and the other non affected, you can dile in just about every posibility there is with this baby. It can make that sweet, soft sound even if it's connected to the most butchery-like guitars. Not much to say. It works well. CE-5 is a pretty rad little guy.. does its job, stays out of trouble, yeah. From Ch1 to CE5 there's no a bad chorus pedals in the history of boss. The CE5 is a summary of decades of experience of boss, the EQ section is very responsive that allows you to change from a crystal shiny chorus to a warm and liquid tone. In my opinion it has nothing super bad and nothing super good but it works for every sound you have in mind. Tanto em pequenas porções para "molhar" o som quanto com uma configuração mais profunda, peça fundamental no pedalboard de qualquer guitarrista. Ótimo controle de graves e agudos. I only use this for a tiny flavour of chorus as I'm not a huge fan of modulation but it is capable of a lot more. In hindsight I should have aimed for something simpler (not that it is a complex pedal) but I bought it from a friend so no complaints. Sounds very clean... the filter section is great and helps to tailor the sound. I own the analog version, but the digitals sound the same. Especially when you add reverb as well. Feedback and delay to go crazy. This is where chorus began with BOSS. So lush. Seperate controls for how much you chorus the highs and lows. roland made, pink labels bucket brigade system. 80s chorus tones. I have early analog CE-5 version from 90s and this chorus just rocks! Creamy, liquid, lush and warm as hell. Stands quite close to its older brother CE-2; can really add lots of warmth and space to cleans. Also, sounds wonderful on dirt channel as it brings back 80's chorusy lead tone. Best tonal range I've ever tested. Uh, yeah, it does what it's supposed to do, hahah! Just a nice chorus, I usually use it more subtly unless I really want it to be noticeable in a mix. Good to warm clean and dirty tones. It works well and as always with boss the pedal is indestructible and gets you a great tone.